Home floods are a horrible thing to happen and what’s more any sort of flooding or leaks from faulty pipes, can lead to the growth of harmful mould beneath your flooring. It really doesn’t take much water for mould to grow and cause a lot of damage. All it needs is a moist dark space and it can happily grow quickly. These situations create must the type of environment that mould and mildew can thrive in. It can be there without you knowing it, particularly in porous materials like carpets. It may take several days for a fan to completely dry out a wet area but the good news is that they also help to circulate fresh air. Even if you think it’s all nice and dry inside, it really isn’t. For this reason, it’s important to keep your fan running for another week or so. You can usually rent High power fans from home improvement stores that provide a tool rental service. These machines are great at removing the excess moisture, making the air feel cooler and limiting the growth of mould and mildew. Steam Cleaning your carpet is important for sanitary and deodorising purposes. Any waterlogged carpet padding will need to be replaced, but this is still much cheaper than having to replace the carpets in your home. 5. Sanitise walls and skirtings – Anything that has been touched by stormwater should be made sanitary. Clean all your walls, hard floors, and other household surfaces with soap and water and use a mixture of bleach diluted in water to sanitise them. Remove furniture from areas showing signs of water damage, being sure to lift up carpets and rugs, if you suspect there could be water present. If it has got soaked and dirty then a restoration company may still be able to restore it. Cleaning up after a flood is a daunting task and if you don’t have the manpower or the equipment to do it yourself then it’s best to call the professionals. 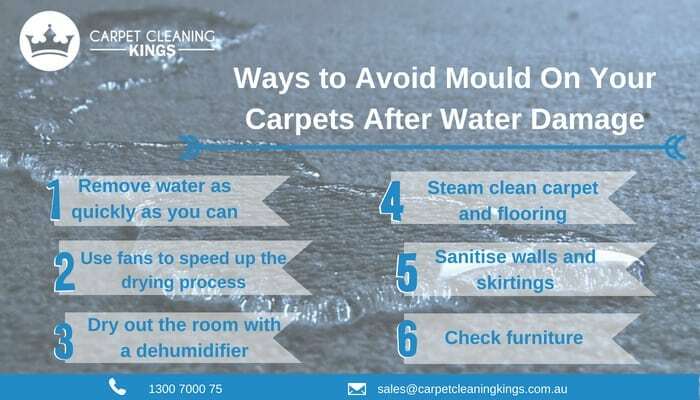 Here at Carpet Cleaning Kings we can handle the entire process including water extraction, removal of bacteria, mould remediation plus a full range of cleaning and stain removal services for properties affected by flooding. We’re here for you 24 hours a day so contact us on 1300 7000 75 for assistance.